I’m getting in the habit of sending out semi-regular emails through my blog newsletter, and I just sent one yesterday (there was an issue with my email service where all emails were being sent to the ‘spam’ folder… please check yours and mark mine as ‘not spam’ if you’re signed up but didn’t get it in your inbox!) and seriously could not believe it’s suddenly September. I’ve gotten pretty good about posting my monthly ‘candidly’ posts right around the turn of the month, but this one caught me off guard! Like I’ve said for the last few Candidly Kristen posts, each month seems to just fly by, but I got my money’s worth for August. It’s honestly been a month filled with some really good things right alongside some equally not-good things, so ‘balance’ has been the name of the game. This post may be a little more random and ‘all over the place’, but the point is to be candid, and there’s a whooole lot of being all over the place in August, so let’s just dig into it, shall we? August Blogging – Yeah, I’m still gonna *celebrate * my August blogging because, whew! What a month! I officially celebrated 2 year of this blog and published a record number of blog posts and videos in August. Quite honestly, that’s where I spent the majority of time and I have no regrets. I hit ‘publish’ on 18 new blog posts, with YouTube videos accompanying the majority of them. I honestly thought my “Why I Left My Sorority” post would cap-off the month, and I didn’t even realize the ‘publish’ date was in September until the next day, ha! So much blogging work happened behind the scenes. And I’m so grateful to say, 1. Y’all noticed, so thank you! and 2., it showed in the numbers. I won’t link all my posts from last month because it’d be a whole paragraph, but I’ll include a few of my favorites below in case ya missed out. Instagram Growth & Blog Campaigns – Right alongside my blog and YouTube, I put in more effort to the ‘gram last month than I’d like to admit. I started a new pink-toned edit to my feed and I’ve already got some good responses to that as well, so thank ya! (And I just passed 2,000 followers there, thank you thank you!!) Not only that, I also had more brand collaborations than, well, ever! I hope you know by now that I only work with brands I truly love and think my audience will enjoy as well. I’ve got a few more current campaigns in the works and I’m excited to share! 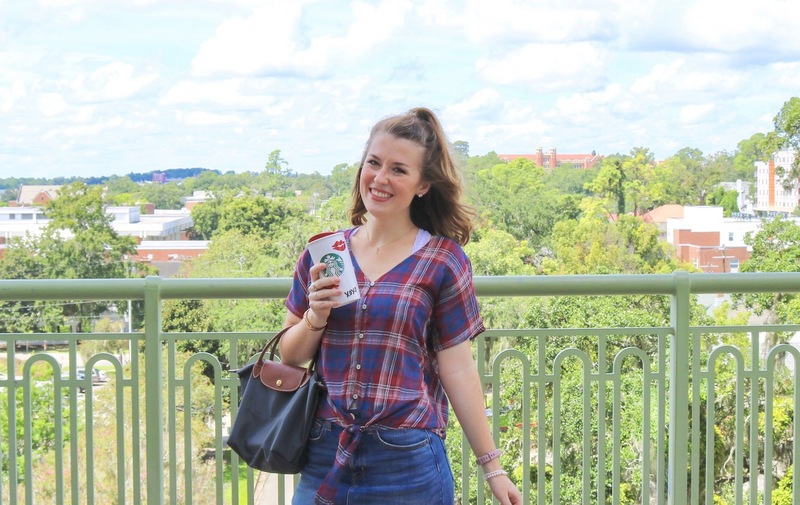 As a full-time student, blogging is pretty much my part-time job, although I’m not exactly making the pay to match, and that’s perfectly fine! But with all the hours and hard work I put in, it’s rewarding to see some benefits. My fave Insta from August! Back-to-College in August – Guys. I started my last semester of college. I’m a senior. It’s wild. I just registered for graduation yesterday and I’ve got some pre-graduation-advising coming up. I cannot believe it. This is my fifth and final semester of college and while I’m terrified of what’s next, I’m honestly really proud and excited of where I am and where I’m headed. Hopefully by my next monthly recap, I’ll have finished applying to law school. Let me know if you want a post all about my graduating-early experience! READ/WATCH: Candidly Kristen: Life Update & Graduating in 2 Years? Candidly… August was not the best month for me mentally. I spent a lot of time home alone or just by myself in the weeks before classes started and it definitely wasn’t easy. I enjoy time alone, but it can get very lonely, even for someone as independent as me. I always want to be honest about my struggles right along with my celebrations. College really is a balance of the good and the bad. I’ve had my best days and my worst days here, but I’ve learned to seek and allow myself joy in things like coffee, ice cream, and fresh flowers. I’ll link a TedTalk on joy here that sums this up perfectly. This semester is supposed to be ‘easier’ on me, in terms of fewer commitments and more free time (to schedule in more peace and things I enjoy), but it also means the looming stress of graduating and “what’s next?”. It’s not always pretty and it’s not always easy. I’m hopeful for the future of this semester and what the next chapter holds. I love having this blog to share my life and thoughts and struggles. I have more aspirations than I know what to do with, but it’s a part of who I am. Here’s to falling down 7 times and getting up 8. I’ve got a good feeling about this month. Sharing this inspirational wallpaper again from Emily Ley on Instagram! Can you believe it’s September? Do you have any big goals for this month? If you have any tips for this stressed-out-college-senior, I’d love to hear from you in a comment!